The Clare native, who came third on RTE talent show The Voice of Ireland in 2015, will sing the song '22', written by Dutch songwriters Janieck, Marcia 'Misha' Sondeijker,and Roulsen. Sarah (24) will perform the song for the first time on RTE's hit dance show, Dancing with the Stars, on Sunday night as part of a Eurovision themed programme, which will also feature Eurovision legend Johnny Logan. On Monday she will jet to Tel Aviv, Isreal to record her postcard. 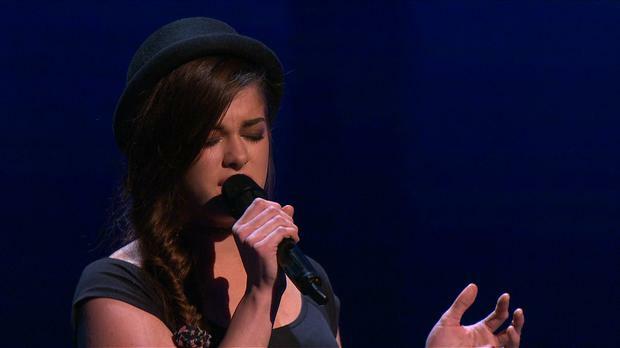 Speaking about being selected to represent Ireland, she said it is like an "early birthday present". "My 25th birthday is next Monday and if you’d told me last year that I’d be chosen to represent my country at Eurovision, performing the song for the first time on Dancing with the Stars this Sunday, and then flying to Tel Aviv on my birthday to record a postcard, I would have told you you were crazy!" Sarah, who is mum to two and a half year old Mia, also revealed that several years ago a psychic predicted that she would take part in a TV show and go on to perform on the Eurovision stage. "He said, 'You'll get a little bit of a spike of fame and you're career singing wise [from the TV show] but when you're 23/24 it's going to be like nothing you've ever experienced before. I see a massive stage, I see Eurovision.'" says Sarah. "The Voice hadn't even happened and I was like, 'What is he talking about?'" Sarah went on to compete on The Voice of Ireland in 2015 and was coached by S Club 7 star Rachel Stevens. She came third in the final. Four years later she's gearing up for the performance of her life. Ireland's Eurovision song, '22', was chosen from over 430 entries by several panels including music experts, journalists, Eurovision fans and students from BIMM at the Eurovision Song Contest Forum. Irish Head of Delegation Michael Kealy said, “We received a huge amount of entries for this year thanks in part to Ryan O’Shaughnessy’s great performance in Lisbon last year. "Sarah has an amazing voice which stood out the minute I heard it and she fits perfectly with our chosen song 22." The singer says she was impressed by the song's upbeat tempo, "When I first heard it was like, 'Oh my God, it's so catchy, a proper ear worm'. I thought it was really poppy and really current, a really good song. It's a strong song for Eurovision." The video for '22', which was filmed on Dollymount Strand in Dublin, is also released today. It was directed by Christian Tierney who has worked with artists including Hozier, Niall Horan, The Weeknd, Macklemore, Demi Lovato, Kendrick Lamar, Drake and The 1975. The filming experience was not quite as glamorous as it sounds; "It was good craic, but it was absolutely the coldest you'd ever imagine," said Sarah. "At one stage it was raining and it was like blades going through my face! I was just so frozen I wasn't able to really move so I was doing a bit of dad dancing!" Sarah will compete in the second Eurovision Semi Final in Tel Aviv on Thursday, May 16. The first Semi Final takes place on May 14 and the grand final takes place on Saturday May 18.